HMC5883L-BB is a breakout board of HMC5883L, a 3-axis digital magnetometer designed for low-field magnetic sensing. The HMC5883L includes high-resolution HMC118X series magneto-resistive sensors plus an ASIC containing amplification, automatic degaussing strap drivers, offset cancellation, and a 12-bit ADC that enables 1° to 2° compass accuracy. The sensor has a full-scale range of ±8 gauss and a resolution of up to 5 milligauss. 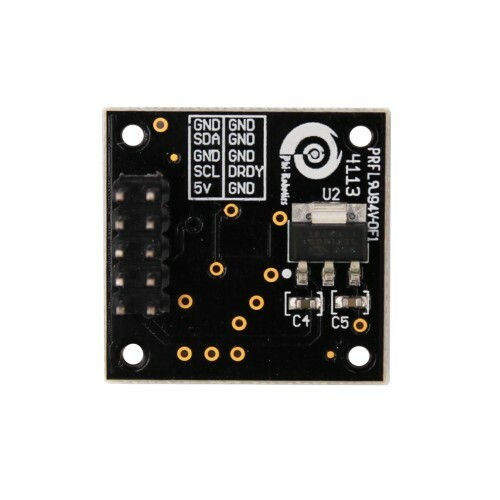 Communication with the HMC5883L is simple and done through an I2C interface. It comes in a low-height, LCC surface mount package. An on board 3.3V power regulator is provided to the board hence no external regulator is required.